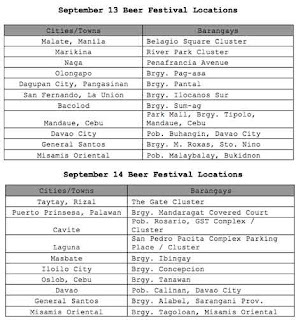 San Miguel Oktoberfest 2013 Schedule and Venue | Happy Beer Day! Home » News » Oktoberfest » Promotion » San Miguel » San Miguel Oktoberfest 2013 Schedule and Venue | Happy Beer Day! San Miguel Oktoberfest 2013 is set to start on September 14, Saturday, at the Circuit Makati (formerly Sta. Ana Racetrack). All beer and music fanatics are invited to come and buy a cup of beer for Php 12.00 only. For more details please scroll down this page. This annual Oktoberfest celebration made by San Miguel will focuses on Pinoy music, food and the indomitable spirit of barkadahan. The Oktoberfest 2013 "Happy Beer Day" Schedule and Venue are listed below. Performances by: Ely Buendia, Apl De Ap, Pepe Smith, Slapshock and many more. For more San Miguel Oktoberfest related information, kindly bookmark this page and share to your joined social networking sites. 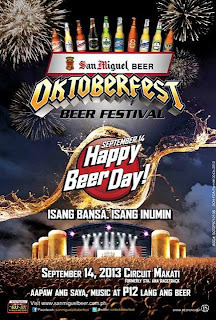 Comments or suggestions about "San Miguel Oktoberfest 2013 Schedule and Venue | Happy Beer Day!" is important to us, you may share it by using the comment box below.